According to google maps, the distance between Brisbane and Cairns is 1048 miles, that’s 209 miles longer than the distance between Lands End and John O’Groats (the most southerly and northerly tips of the UK). In my ‘Pommy’ wired brain this distance seemed colossal, it is however only a small fraction of the vast Australian coastline. For September and October last year my only purpose was to get from Brisbane to Cairns and see the famous East Coast of Australia on my way. I returned down under in early September having travelled home to celebrate my sisters’s wedding. It was great to catch up with family after five months abroad but the typically grey UK skies and cold summer drizzle soon had me pining for the cobalt blue skies and cyan waters that the east coast promised. I bypassed Brizzy (Brisbane) having spent some time in the city earlier in the year and headed straight for Mooloolaba on the Sunny Coast (Sunshine Coast; Prepare yourself for plenty of affectionately abbreviated Aussie place names during these next few posts). I spent ten days in Mooloolaba adjusting once more to Australian backpacker life. From a full fridge, my own room and Mum’s home cooking back to rooting around the communal fridge for my groceries (often to find they’ve miraculously vanished anyway), an overpriced bunk bed in a shared room and a diet largely centred around super noodles. I paint a dire picture, but what comes with all that is freedom, adventure and quite a lot of fun. Swings and roundabouts hey! The first two weeks of my 1048 mile journey was centred around one thing; The famous Humpback Whale and their 6,000+ mile annual migration. These incredible cetaceans migrate from their icy Antarctic feeding grounds to the warm sheltered waters off Australia’s east coast in order to mate and give birth to their young. And they don’t half make a song and dance about it. These rorqual whales are famous for their lively acrobatic behaviour and are renowned for impressive displays which include slapping their knobbly pectoral fins and huge flukes repeatedly on the surface of the water. The piece de resistance of their routine is their breach; thirty five tonnes of blubbery whale fully exiting the water in a spectacular leap and crashing to submersion seconds later. I became somewhat obsessed with whale watching at about fourteen years old after reading Mark Carwardine’s ‘On the trail of a Whale’. I later learnt about this epic journey and since then, witnessing the phenomenon of the migration along the Aussie coast was a bucket list activity for me, so a whole ten years later (gosh I am getting old) I was finally ready to tick the box. 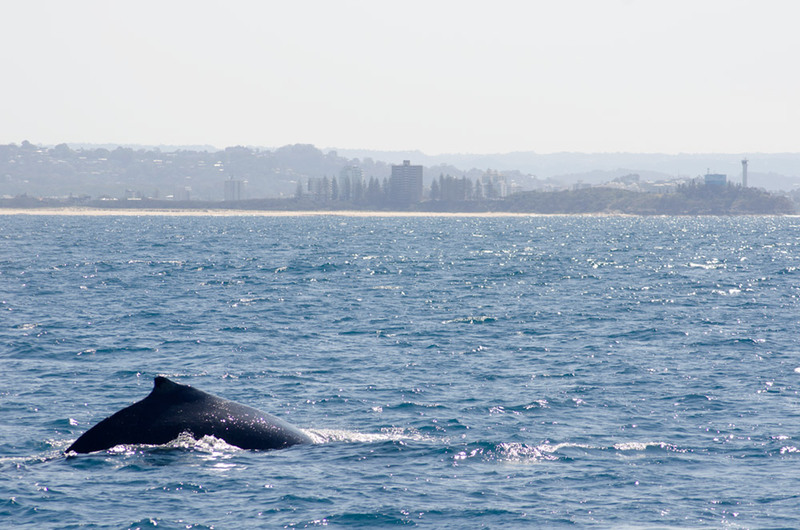 Humpbacks surfacing and pec slapping off of Point Cartwright, Sunny Coast. 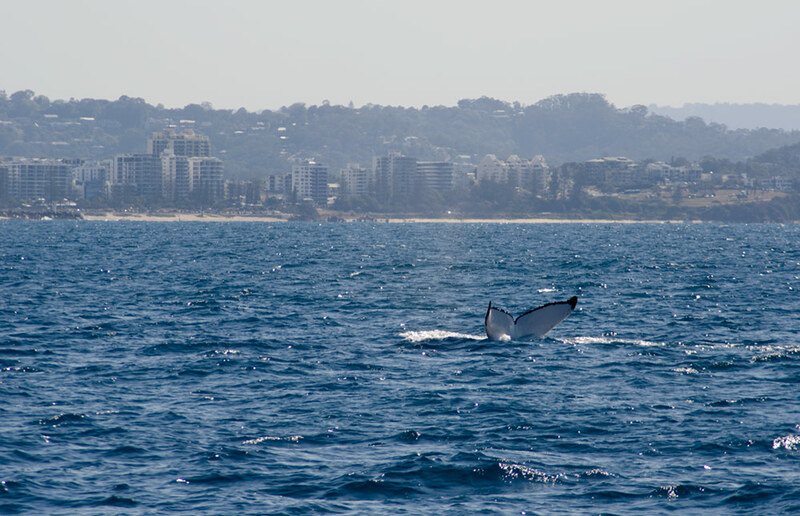 I began with a couple of hours boat trip out of Mooloolaba where the whales surfaced against the slightly bizarre backdrop of a heat-hazed cityscape. During this three hour trip we were also fortunate enough to witness a Humpback calf mischievously chasing a pod of Bottle-nosed Dolphins close to our bow. Usually on a natural history excursion the protocol is to be as quiet and unobtrusive as physically possible, however, our skipper encouraged us to cheer, clap and woop while the whales were in our vicinity assuring us that the noise would draw the curious mammals closer. Playing with dolphins off the coast of Mooloolaba. My second trip out to see the whales was even more unusual. The aim wasn’t to just watch the whales from the safety of the boat, but to jump in the water and snorkel with them. We set out from Mooloolaba Wharf early morning and headed out to find the whales with SunReef, the first company to offer this experience in Australia. The idea is to cut the engine 100 meters or more from the action, jump in and keep your fingers crossed that a whale will be curious enough to come and say hello. After frolicking in the waves of Mooloolaba beach, the temperature of the water deep out in the Coral Sea was rather a shock to the system. I was also feeling quite green but was concerned that if I was labelled ‘seasick’ I wouldn’t be allowed in the water, so I breathed deeply and swallowed my breakfast back down a few times. I was adamant I didn’t want to be the one wth my head in the toilet while everyone else went whale snorkelling! 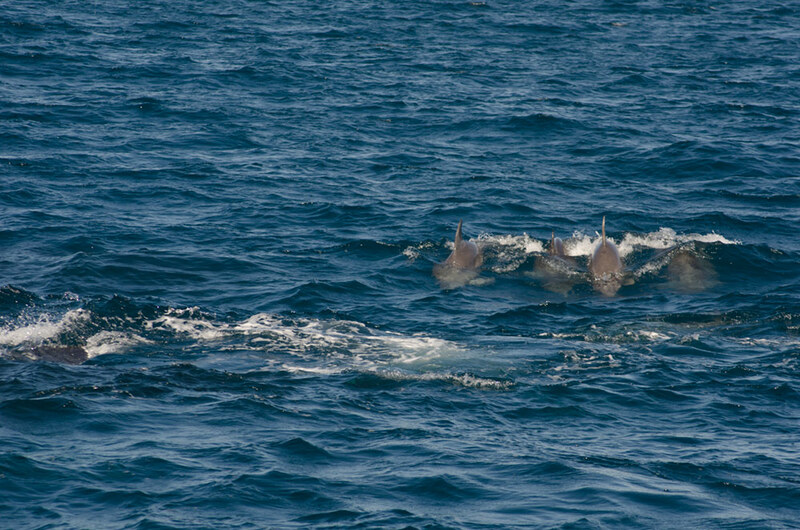 However, the whales we encountered that day weren’t quite playing ball. Despite seeing a pectoral fin gliding through the water towards me above the surface, which was disconcerting enough really, the whales dived and disappeared. Snorkelling with Humpbacks (and actually seeing them below water!) has been added to the bucket list. I believe the South Pacific islands of Tonga are a great destination to give it another go so despite ticking one bucket-list box, I’ve stumbled upon another to add to the list. The first group of snorkelers from out boat getting out amongst the whales. 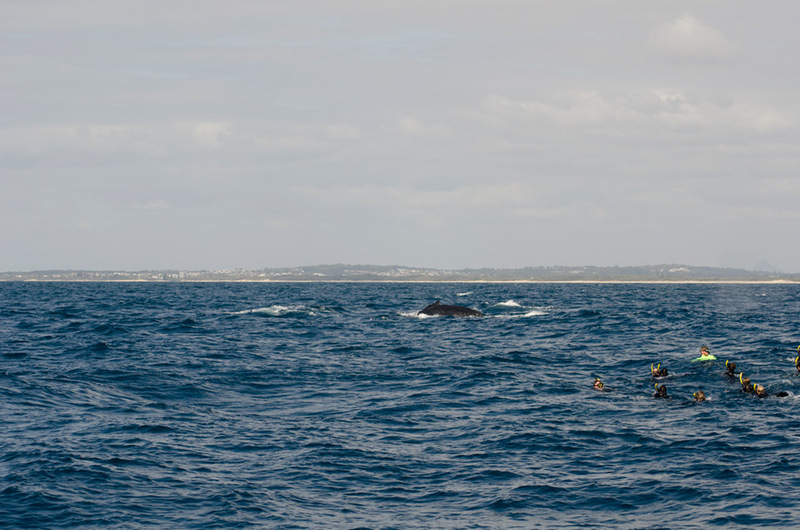 Eventually, as a last ditch attempt to see the whales underwater both groups got in at the same time. Preparing to jump off the back of the boat, feeling greener than ever. The right hand photo was taken in the water on my GoPro, that tiny little triangle on the far left before the people’s heads is the whale’s dorsal fin- it felt a lot closer in the water believe me! 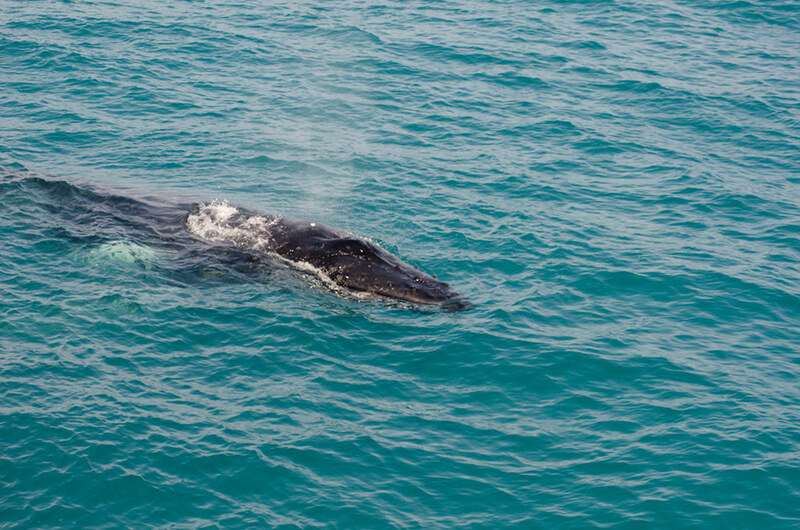 You can see the whales right up the East Coast from June through November, but Hervey Bay is the location you hear about most over all others. This is because of the shelter that both the bay itself and the World Heritage listed Fraser Island, just off the shore, provides. This unique part of the coast gives the whales a safe haven to frolic around in with their young and is thus the best place to view the whales during their migration. So, naturally Hervey Bay was my next stop! The town itself felt a little modest after leaving the continually sprawling urbanisation that is the Sunny Coast. It was more understated, maybe shabbier… and for those reasons I quite liked it. The stores along the esplanade were spread out over a couple of kilometres so it didn’t feel like there was a real ‘centre’ to the town. Having spent 10 days in Mooloolaba I was aware that I needed to get a shifty on up the coast; if I kept spending ages in each place I’d need to stop to work before reaching Cairns. But… the wind was up. There would be no boats leaving the marina for a good few days whilst they waited for the wind to calm down. “You’d be hard pushed to see anything out there right now” the woman at the booking office assured me. ARRGH! 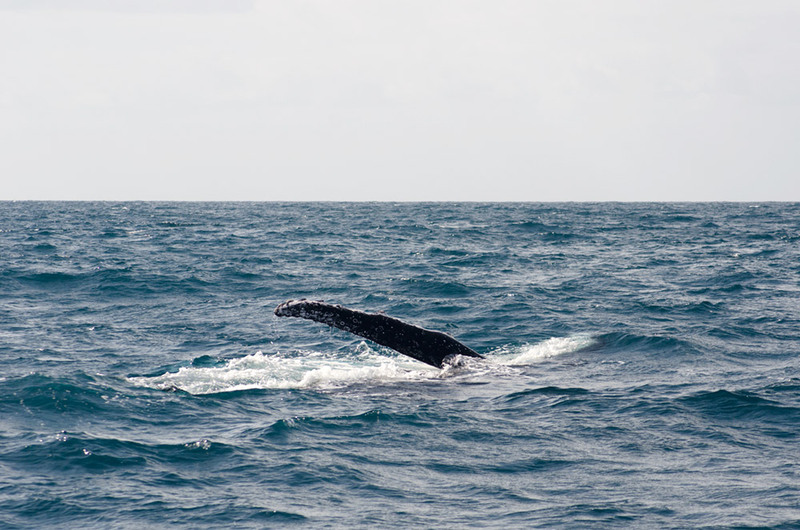 I toyed with the decision of continuing north and waving goodbye to watching Humpback Whales from Hervey Bay, after all, I’d seen them from Mooloolaba. But something in me niggled away and a determined voice in my head kept saying, “But this is Hervey Bay! This is THE place to watch Humpbacks. Give it two more days and see.. gooo on”. Three days later, the wind subsided and we were on! It was far from a wasted couple of days though, the hostel where I stayed was beautifully sheltered and laying in a hammock reading my Lonely Planet Aussie guide was nothing short of blissful. I also hired a bicycle and cycled the 6 miles from Urangan Pier to just beyond Point Vernon and back and watched Flying Fox bats at dusk on the Pialba leg of the Hervey Bay esplanade. Their wingspan can reach an astonishing 1.5 meters and their strangely fox like bodies look bizarre hurtling through the air. Witnessing these bats coming into roost at dusk is a must whilst along the East Coast. As the sky melts into a slate blue your ears fill with raucous screeches and the sky seems to blacken further while hundreds of Flying Foxes sweep from tree to tree. I decided to lay on the grass below and watch the spectacle unfold until the night’s darkness had engulfed the bats. Flying Foxes on the esplanade and our $5 a day rental bicycles on the beach, Hervey Bay. The wind eventually died down so after biding my time for a few days I was finally able to take a boat out to watch Humpback Whales in Hervey Bay. This time the whales came so close to the boat that I had to ditch the Nikon and film with my iPhone on more than one occasion. The clarity of the Coral Sea meant we could see the whales gliding through the water as they came to investigate our bow. At one point a calf made a very half arsed attempt at a breach while the main activities seemed to be pec-slaps and rolling. 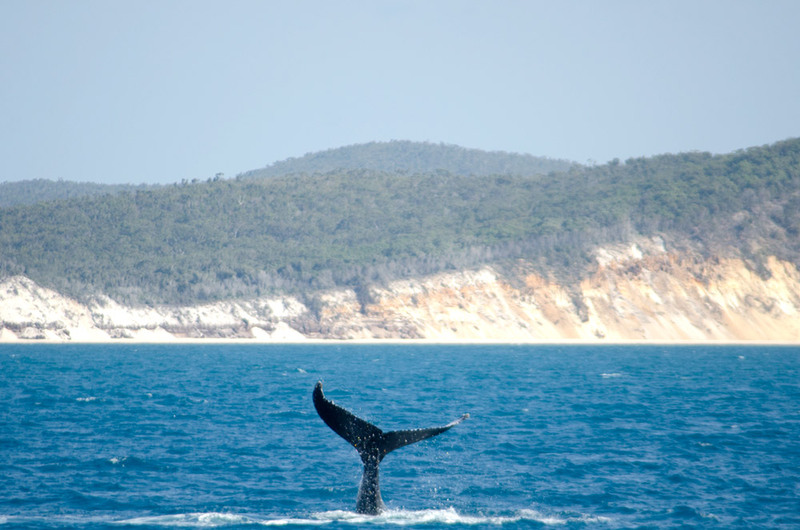 A Humpback dives against the Northern tip of Fraser Island. Some came very close to the boat in their renowned curiosity. There’s something about witnessing cetaceans in the wild. Something thats captivated me from a young age. Its hard to describe. Its sort of a magnificent swelling inside that makes you feel so inferior and inadequate in comparison to what Mother Nature has to offer. It’s an incredible feeling. A feeling that reinforces a massive admiration and respect for our natural world. Thats why, although seeing Humpback Whales from Australia’s East Coast has always been a bucket list activity for me, it’ll never be the last time I do it. When I eventually return to Australia for my second year visa I will plan it entirely around those magnificent creature’s migration. Plus, I still have to see that full adult breach! Great reading this, look forward to many more! !